Lot Detail - (A) GIANT .577 BLAND-PRYSE 5 SHOT REVOLVER. (A) GIANT .577 BLAND-PRYSE 5 SHOT REVOLVER. Marked "T.W. Watson Pall Mall London" upon the top strap and serial numbered 1547 on the frame. Nickel finish with ribbed 6-1/4" octagon barrel. Single and double action operation with top-break "Pryse" action. One piece checkered walnut grip with buttcap and lanyard swivel and ring. 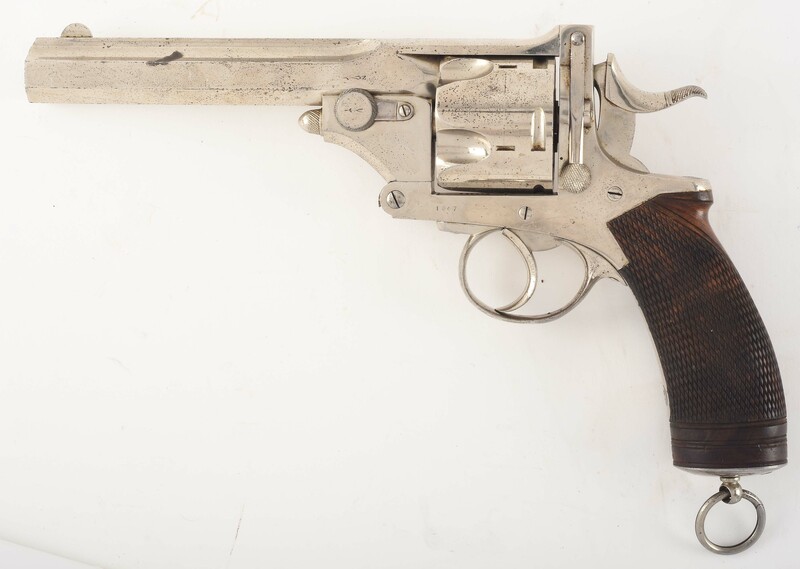 This incredible "Stopper Revolver" was intended for the quick dispatching of the most dangerous game, especially tigers in the Indian regions under British Rule. Several articles were written about these massive revolvers in the 1980's and 90's and described these revolvers as the ultimate "Big Bore Handgun". 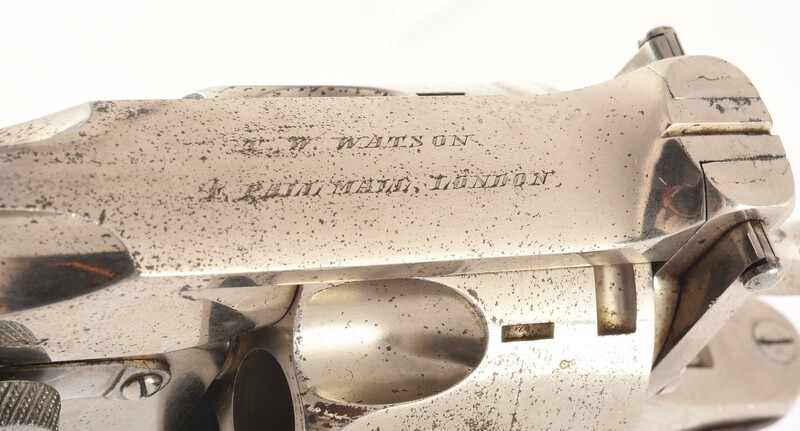 This top break Pryse revolver is both English and Belgian proofed and interior of frame is marked "PR&S JOINT PATENTS". Thomas Watson was the son-in-law of renowned gun maker William Tranter. In 1875 Thomas Watson acquired the manufacturing facility at 4 Colonnade in Pall Mall from Durs egg. He maintained the manufacture of the finest quality arms and equipment until 1885 when he transferred the company to his sons. 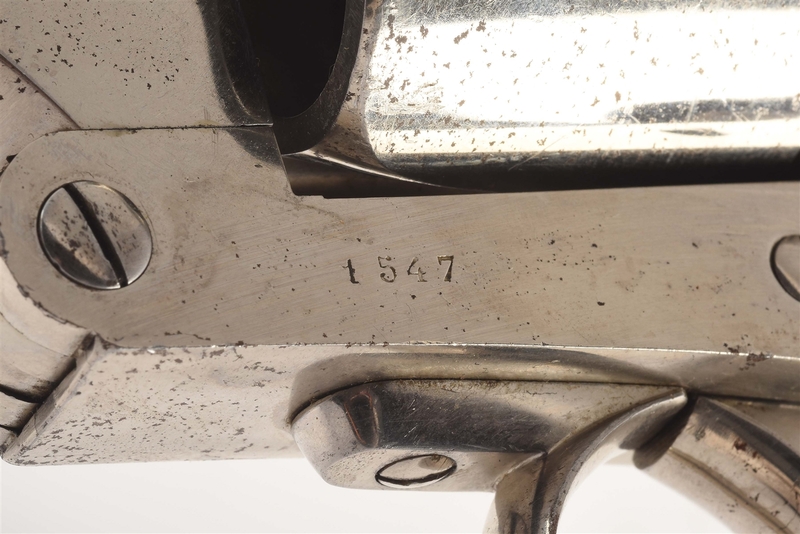 The company was renamed Watson Brothers and continued the tradition of manufacturing best quality guns. CONDITION: Very fine with excellent bore and mechanics. Single and double action operation both work properly. Grips are very good with slight high point wear but very good. The nickel finish is slightly stained and has light spotting on the barrel. Numerous small scratches from storage and use. 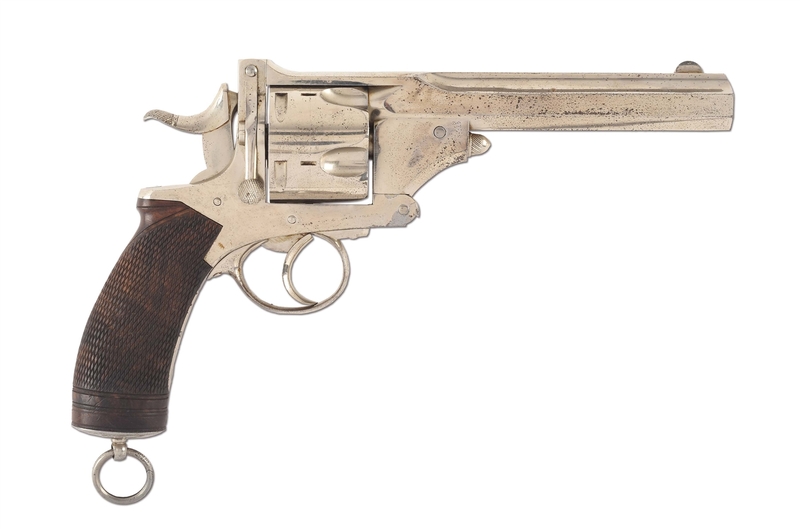 Truly a unique and rarely seen .577 Bland Pryse revolver and even a rarer opportunity to own.